ITSM projects come in all shapes and sizes, dependent on the size of the company and resources available. Yet, even many of the most well-funded projects are still prone to failure. With the wide array of best practices and frameworks available that are built to help IT projects succeed, how are projects still falling through the cracks? 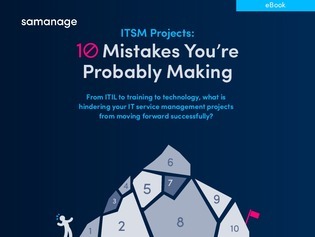 Open this guide to learn about the 10 biggest mistakes that can occur within ITSM projects, from personnel inconsistencies to neglecting service quality. In addition to learning how to recognize these tell-tale signs, you’ll also find tips for overcoming and dodging these mistakes before they manifest into bigger problems.